Background: Clinical examination, while useful, has been shown to be insufficient as the sole screening method in infants. Ultrasound examination at 8 weeks in high risk infants is an integral part of the screening process in some units. Aims: To show the efficiency of hip sonography in detection of developmental dysplasia of the hips in those without clinically dislocated hips. Methods: All infants born at the National Maternity Hospital between January 1994 and December 2001 were included. All those with clinically dislocated hips were treated by a Pavlik harness and referred for follow up to a paediatric orthopaedic surgeon. An 8 week hip ultrasound scan was performed for those infants with stable hips on examination but who met the following criteria: (1) a first degree relative with congenital dislocation of hips; (2) breech presentation at birth; and (3) a persistent “click” at birth in an otherwise stable hip. Results: During the period of study a total of 52 893 infants were born in the National Maternity Hospital. Based on the criteria above, 5485 hip ultrasound scans were performed. Of those scanned, 18 (0.33%) were found to have dislocated hips and 153 (2.78%) to have dysplasic hips. The 18 infants with dislocation were treated with Pavlik harness; the remaining 153 were followed up by serial ultrasound examinations but did not require active intervention. Conclusions: Among the population of infants at increased risk of developmental dysplasia of the hip, the hip screening programme identified 18 cases among 5485 infants; a rate of 3.2 per 1000. Hip sonography is therefore worthwhile. We introduced our hip ultrasound programme following a pilot study in 1994. We performed ultrasound on those infants deemed to be at greater risk of dysplasia. In this study we have undertaken to assess and audit the value of hip ultrasound screening during the seven years of its operation. To determine the most appropriate timing for hip ultrasonography in those at risk infants we performed a pilot study at the National Maternity Hospital. In this study we performed hip sonography on 131 (262 hips) infants at increased risk of developmental dysplasia of the hip at day 3 and 8 weeks of life, and hip x ray at 4 months of life. Of these, 40 had a positive family history of hip dislocation in a first degree relative, 68 were breech presentation at birth, and 23 had persistent clicks (equivocal examination) on physical examination. Pilot study to evaluate hip sonography on day 3, week 8, and radiology at 4 months. u/s, ultrasound. All infants born at the National Maternity Hospital are examined on day 2 of life using the Ortolani and Barlow manoeuvres. Those infants found to have clinically dislocated hips at this time are placed in a Pavlik harness and referred to our orthopaedic service. Those infants who, although clinically normal but were deemed to be at high risk based on certain criteria—(1) first degree relative with congenital dislocation of the hips; (2) breech presentation at birth; (3) a persistent click at birth in an otherwise stable hip—are booked for an ultrasound examination at 8 weeks. Infants were examined using the static technique pioneered by Graf and colleagues.14,15 All the ultrasound examinations were performed by the same consultant paediatric radiologist (VBD). The use of one radiographer avoided inter-observer variability, which has previously been cited as a major problem with ultrasonographic hip screening, especially during the first three weeks of life.16 Hip dysplasia is when the acetabulum is poorly formed with flattening of the lateral margin and a wide cartilaginous rim. Hip dislocation is when the femoral head is not held within the acetabulum. All infants in whom dislocation was detected were referred to our orthopaedic service for further assessment and treatment. All infants in whom dysplasia was noted, were scheduled for a follow up scan at 10 weeks of age. We retrospectively reviewed the results of all such scans performed between January 1994 and December 2001. During the period of study 52 893 infants were born at the National Maternity Hospital. Of these infants, 5485 met the inclusion criteria for our study. Of note, these infants were clinically normal—that is, did not have clinically dislocated hips. Table 1 subdivides the cases according to risk factor. Of the 5485 infants scanned a total of 18 infants were found to have a dislocated hip and 153 to have varying degrees of dysplasia (see fig 2). Total number of births during this study period: number of infants at risk in total, and number with dislocation and dysplasia. We reviewed our dislocated and dysplastic cases according to risk factors. We found family history is the risk factor most strongly associated with dislocation (see table 2). The follow up scans revealed that all dysplastic hips had normalised without any intervention. Those who failed to attend for initial follow up appointment were contacted by a member of our nursing staff and received a further appointment. All attended for follow up ultrasound scans. Our results show that infants who are historically at increased risk of hip dislocation but who are not clinically dislocated can be followed using ultrasonography, thus avoiding unnecessary hip splinting. We identified a number of infants without dislocated hips but with dysplastic hips on ultrasound who we followed with serial sonography. None of these infants had abnormalities of their follow up scans. Importantly none of these infants had been referred for unnecessary orthopaedic intervention. These findings represent the experience of a large maternity hospital with over 8000 births annually. All of the hip ultrasound scans were performed by the same consultant radiologist. Through this action we have prevented inter-observer error in relation to ultrasound interpretation. Developmental dysplasia of the hip is a multifactorial disease with an aetiology consisting of both environmental and genetic factors. Those at risk are so due to either17 decreased resistance of the hip to dislocation (shallow acetabulum, connective tissue laxity, female gender) or external factors (oligohydramnios, breech presentation, primiparity, and tight clothing). There are certain groups of infants who are at greater risk of developmental dysplasia of the hip. Breech position at birth is seen in about 3% of births, and developmental dysplasia of the hip is known to occur more commonly in this population.18,19 Wynne-Davies reported an increased risk to subsequent children in the presence of a diagnosed dislocation20 (6% risk with healthy parents and an affected child, 12% risk with an affected parent, and 36% an affected parent and child). Screening for developmental dysplasia of the hip in the newborn meets many of the criteria for a good screening programme. Developmental dysplasia of the hip is a serious health problem for both the individual and the community; it has a recognisable early symptomatic stage and an accepted treatment for patients with recognised disease. Screening using clinical examination was first introduced in 1969 in the UK following the work of Ortolani and Barlow. Thus clinical examination has been the mainstay of screening; however, this method has repeatedly been shown to be unsuccessful at identifying all cases. Ultrasonography offers a number of advantages over the previously used radiological investigation. Firstly, the test can be performed at an earlier age, namely 8 weeks, whereas reliable x ray changes require waiting until the infant is 3–4 months of age. We have adopted 8 weeks as optimal timing based on a pilot study in which we found that earlier scanning led to a high false positive rate in the area of dysplasia.11 These findings were subsequently supported by the study Marks et al in Coventry10 who performed initial scanning at 48 hours of life and then saw a 90% normalisation of abnormal scans. The second advantage of ultrasound is that it helps to overcome the concerns of over diagnosis and over-treatment. Obviously those with frank dislocation do require abduction splinting; however, in the case of dysplasia, intervention is not immediately required and ultrasound permits the safe monitoring of the infant safely and thus avoids over-treatment. Our experience would suggest that varying degrees of dysplasia ultimately normalise over time. This avoidance of abduction splinting is important as it has recognised side effects, including avascular necrosis of the femoral head, tibial torsion, and femoral nerve palsy. There have been concerns that ultrasound screening in the first few days of life may be sensitive but not sufficiently specific, resulting in an excess of infants being treated. In one study from Norway there was a large increase in the number who received treatment. This is clearly a reservation that requires consideration. In our series, just under 3% of those screened were deemed to have dysplastic hips. These infants were followed rather than actively treated, and on follow up none were noted to have subsequent dislocation. While our findings give some estimation of the likely yield in the clinical setting, there remain a number of important issues. Hip screening is a time consuming procedure, and must be performed by someone with the necessary skill and training. For many units it would be impractical to have a radiologist specifically for this purpose and tests would need to be undertaken by others, for example, specifically trained radiographers/nurses. While we feel that the programme is worthwhile for those at high risk, the question remains as to whether ultrasound screening of all infants should be considered. These findings provide an insight into the natural history of dysplasia. In particular, we found that these infants improve over time. In the absence of dislocation, hip ultrasound allows the opportunity to observe without actual intervention. In addition, hip ultrasound allows the identification of an important subgroup of infants who have clinically undetectable dislocation who would otherwise have presented at a later age, with possible long term effects on hip development. Our study contributes to the present attempts to gain uniformity and acts as a benchmark for other studies. Rosendahl K . Ultrasound in the diagnosis of congenital dislocation of the hip: an update. Congress of European Society of Paediatric Radiology, Bergen, Norway 17–21 June 2002. Dezateux C, Godward S. Screening for congenital dislocation of the hip in the newborn and young infants. In: Recent advances in paediatrics 16, chapter 3 1998:41–57. Sanfridson J, Redlund-Johnell I, Udén A. Why is congenital dislocation of the hip still missing? 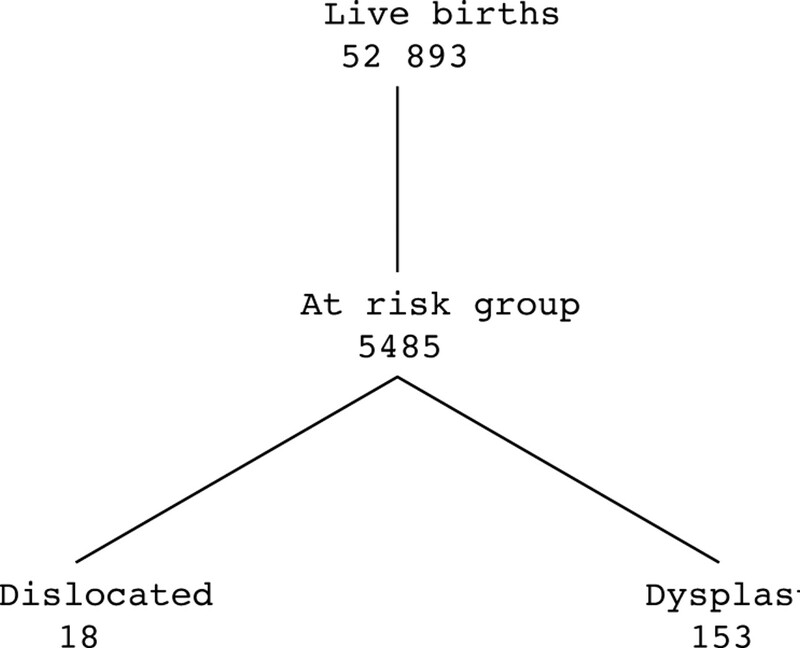 Analysis of 96,891 infants screened in Malmö 1956–1987. Acta Othop Scand1991;62:87–91. Jones D . An assessment of the value of examination of the hip in the newborn. J Bone Joint Surg (Br)1997;59:318–22. Walker G . Problems in the early recognition of congenital hip dislocation. BMJ1971;3:147–8. David TJ, Parris MR, Poyner MU, et al. Reasons for late detection of hip dislocation in childhood. Lancet1988;I:147–9. MacNicol MF. Results of a 25 year screening programme for neonatal hip instability. J Bone Joint Surg (Br)1990;72:1057–60. Poul J, Bajerova J, Straka M, et al. Early diagnosis of congenital dislocation of the hip. J Bone Joint Surg (Br)1992;74:695–9. Godward S, Dezateux C. Surgery for congenital dislocation of the hip in the UK as a measure of outcome of screening. Lancet1998;351:1149–52. Marks DS, Clegg J, al-Chabi AN, et al. Routine ultrasound screening for neonatal hip instability can it abolish late-presenting congenital dislocation of the hip? J Bone Joint Surg (Br)1994;76:534–8. Garvey M, Donoghue VB, Gorman WA, et al. Radiographic screening at four months of infants at increased risk for congenital hip dislocation. J Bone Joint Surg (Br)1992;74:704–7. Rosenberg N, Bialik V, Norman D, et al. The importance of combined clinical and sonographic examination of instability of the neonatal hip. Int Orthop1998;22:185–8. Darmonov AV, Zagora S. Clinical screening for congenital dislocation of the hip. J Bone Joint Surg Am1996;78:383–7. Graf R, Tschauner C, Klapsch W. Progress in prevention of developmental dysplasia of the hip by sonographic newborn hip “screening” report of a comparative follow-up study. J Paediatric Orthop1993;2:115–21. Graf R . The diagnosis of congenital hip-joint dislocation by ultrasonic compound treatment. Arch Orthop Trauma Surg1980;97:117–22. Berman L, Klenerman L. Ultrasound screening for hip abnormalities: preliminary findings in 1001 neonates. BMJ (Clin Res Ed)1986;293:719–22. Leck I . An epidemiological assessment of neonatal screening for dislocation of the hip. J R Coll Physicians1986;20:56–61. Hinderaker T, Daltveit AK, Irgens LM, et al. The impact of intrauterine factors on neonatal hip instability: an analysis of 1,059,479 children in Norway. Acta Orthop Scand1994;65:239–42. Committee on Quality Improvement, Subcommittee on Developmental Dysplasia of the Hip. Clinical practice guideline: Early detection of developmental dysplasia of the hip. Paediatrics2000;105 (4). Wynne-Davies R . Acetabular dysplasia and familial joint laxity: two aetiological factors in congenital dislocation of the hip: a review of 589 patients and their families. J Bone Joint Surg Br1970;52:704–16. Goss PW. Successful screening for neonatal hip instability in Australia. J Paediatr Child Health2002;38:469–74. Rosenberg N, Bialik V. The effectiveness of combined clinical-sonographic screening in the treatment of neonatal hip instability. Eur J Ultrasound2002;15:55–60.